A report published in the August 26, 2018 edition of the New England Journal of Medicine indicates that the drug Xarelto may offer no benefit in preventing venous thromboembolism events among patients who are already hospitalized. 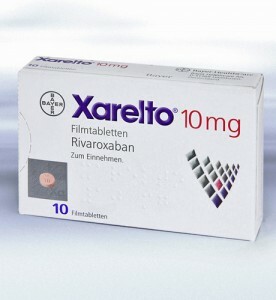 Xarelto (rivaroxaban) is a newer generation of anticoagulant medications prescribed to reduce the risk of blood clots. Although the drug is marketed as a superior alternative to warfarin, thousands of adverse event reports have been submitted that claim the drug led to severe and fatal bleeding events. The recently published study on Xarelto was sponsored by Janssen Pharmaceuticals, which manufactures Xarelto. It involved a double-blind study of over 12,000 patients at a high risk of venous thromboembolism events. Roughly half of the patients were given a placebo. The other half of the patients were given a once-daily dose of 10-milligram Xarelto. The study lasted for 45 days. Sixty-six of the 6,012 patients in the control group—those who took the placebo—suffered a venous thromboembolism event. Out of the 6,007 patients who took Xarelto, 50 suffered a venous thromboembolism event. This is a slight decrease. However, the potential benefit of taking the drug appears to be outweighed by the significant risk of bleeding events. Just 0.15% of patients in the control group suffered a bleeding group, compared to 0.28% of patients in the Xarelto group. Xarelto has been in the news frequently in recent years because of the thousands of lawsuits filed that claim life-threatening complications from the drug. The lawsuits were centralized into a multidistrict litigation (MDL), which is pending before U.S. District Judge Eldon Fallon in the Eastern District of Louisiana. About 20,000 product liability lawsuits are currently pending in the MDL. As part of the MDL, each plaintiff will share in the coordinated pretrial proceedings, including discovery. However, the plaintiffs retain their right to an individual trial by jury. Following pretrial proceedings, the judge scheduled a handful of bellwether trials intended to assess how juries might respond to physical evidence and testimony. In most MDLs, it’s generally expected that the bulk of the lawsuits will be settled after this point. However, there has yet to be any progress made toward settlements in the Xarelto MDL. Because of this, Judge Fallon ordered the selection of 1,200 Xarelto lawsuits for discovery. These may be remanded back to their home districts throughout the country for individual trials. The Xarelto plaintiffs share similar allegations. They claim that the manufacturer did not give them adequate warnings about the serious risks of the drug—most notably, the risk of uncontrollable bleeding. With the older anticoagulant, warfarin, doctors could administer a therapeutic dose of vitamin K to reverse the effects of the drug when a major bleeding event occurred. This antidote doesn’t work with Xarelto, and the drug lacks any other antidote.